Cinderella's carriage made with junk. 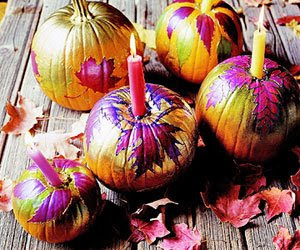 Painted leafs with candles in place of the steam. 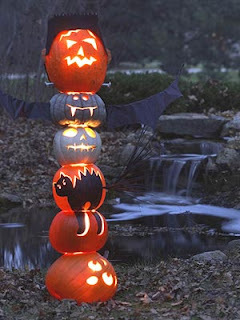 Stacked pumpkins that are painted, and scary faces carved in them. I found all these on the Better Homes and Garden site. I think the Cinderella one is the best. I am with you~I want to decorate my pumpkin as a coach! Cinderella is definitely cute but the jewel embellished pumpkin is very elegant! How fun those pumpkins are! I loved the Cinderella coach and the mice are too cute! Cinderella was always my favorite. Oh how I love that Cinderella pumpkin! What great imagination!! I need to get a couple of the carvable faux pumpkins to make a couple fairy houses, A Cinderella carriage would be so cute. You find the neatest things Glenda! Thanks for your sweet comments!! I like the faux pumpkin idea from Edie Marie's Attic...I probably have most of the junk used in the first photo...I even have that exact soap dish...Don't think I can convince the field mice to go along with it though....If I found a pumpkin big enough I could use Callie Anne....Hobby Lobby here I come. 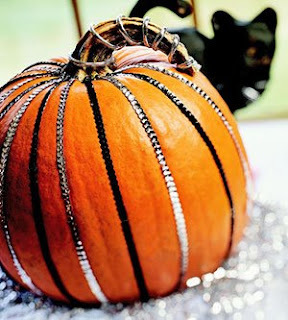 So cute the Cinderella pumpkin, and what fun decorating ideas. 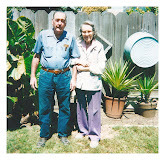 I just read you post on Mervyn's closing, our Mervyn's in Modesto is also closing and yes it is sad, I used to shop for my kids there when they were small and for myself too. Another icon store gone, and monkey Wards too. 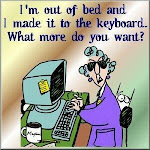 My Mom used to work for Wards.Its just hard times for everyone. 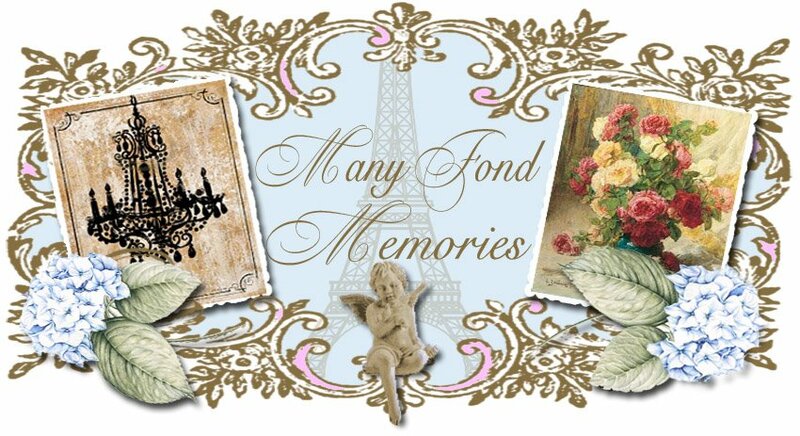 I enjoyed my time visiting have and reading your posts. 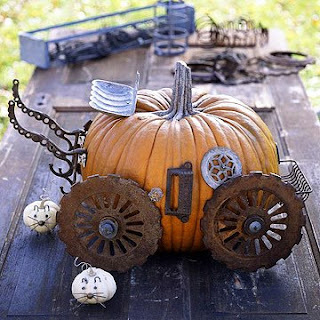 LOVE the pumpkin wagon! That's my favorite hands down, but they are all awesome.